Since there are quite a few differences between the WM 6.1 Taskbar files and WM 6.5 taskbar I have created a new thread dedicated to WM 6.5 and the taskbar. This will not be as technical as my previous taskbar thread. For methods on how to edit a dll, what a dll looks like, how to replace files and so forth please refer to this thread Custom Taskbar Please remember this is a work in progress since WM 6.5 is new so there are going to be a few issues at first but we will work around it. 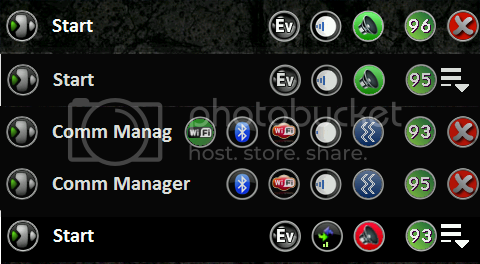 For the Bluetooth Icon - There are two bmps that WM 6.5 uses to display the BT & headset icons on the Transparent home screen. One is the standard file, i.e. "BT On Mode.bmp", and the other is a background file, "BT On Mode Mask.bmp". The Mask file is the negative/transparent background of the regular file. The Mask files will need to be provided along with the other files in order for the BT top bar icons to display correctly on the standard transparent home screen. Otherwise, the system will use the previous (stock) Mask file, which cause the distorted image. As an addendum to my previous find, I believe that a side effect of anyone using the stock WM6.5 dialer along with tsowen's of 12aon's taskbars will be that the Bluetooth icon will not display in the taskbar. The reason for this is that each of their taskbars includes phcanOverbmp.dll, which seems to override the BT icon info in the shellres.192.dll. This dll looks for the BT icon bitmaps in the \Windows folder (both the icon, and the Mask background file), and in the absence of the Mask bitmap, on the standard home screen, no icon will be displayed. I can confirm this because I tried deleting the "Mask" bitmap files prior to cooking my ROM, thinking that it would just use the regular bitmap files, but instead, I have no BT icon show up on the top bar. If you are not using the HTC Dialer, I recommend following tsowen's suggestion regarding the battery icons. This may also correct the BT icon issue, since I don't think those bitmaps are part of the standard 6.5 install. Someone who is using the stock dialer will have to test it, though. So maybe its a good idea to have 2 separate taskbar versions after all - one for people using the HTC dialer (including phcanOverbmp.dll), and one for those using the stock dialer (using phcanbattery.dll). Of course, we still have to work out all the kinks, yet. But progress is definitely being made . Make sure you double check and you deleted everything out of the .dll other than the battery images. Tried the above mentioned technique and it worked correctly. © Copyright. Copyright in the pages, screens, text, files and images appearing in this thread is owned by originating owner(s) or others as indicated. The information and materials contained in the thread may not be distributed, licensed, modified, published, reposted, reproduced, reused, sold, transmitted, used to create a derivative work or otherwise used for public or commercial purposes without express written permission of the originating owner(s). WM6.5 Dlls.zip (651.8 KB, 2334 views) Click for barcode! vista-artistic-icons.zip (45.8 KB, 1348 views) Click for barcode! Last edited by tsowen; 05-17-2009 at 09:19 PM. This post has been thanked 54 times. 1. 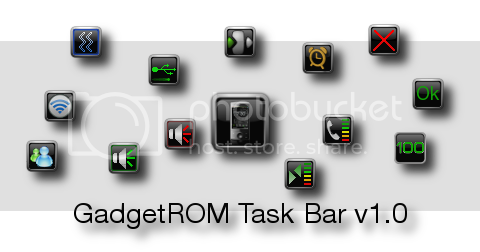 Corrected All BT Icons and added mask.bmp files for corresponding images. RevA Icon.zip (42.5 KB, 1029 views) Click for barcode! WM6.5 Dlls.zip (1.42 MB, 1123 views) Click for barcode! tsowentaskbar6 WM6.5 version.cab (1.17 MB, 2981 views) Click for barcode! Last edited by tsowen; 05-13-2009 at 11:42 AM. The wait is over here is taskbar 3v1.5 for WM 6.5 as always install sdkcerts then the taskbar cab. Added Rev A Cab for those who need it. tsowentaskbar3v1.5 WM6.5 version.cab (1.39 MB, 1607 views) Click for barcode! RevA Icon.cab (171.2 KB, 690 views) Click for barcode! Last edited by tsowen; 04-26-2009 at 08:27 PM. LET ME KNOW HOW YOU ALL LIKE IT!! install sdkcerts AND have to make the changes in your registry posted in tsowens post. some people are deleting this regkey from their roms. this will effect the signal icon, sync icon, it will point the these icons to the Shell file instead of the CDMA file. So if you have this problem after installing a taskbar, check your registry to see if this is their, if not. add it. For the Bottom Buttons on the Newer system Builds. Use the Classic Blue Theme. Brock1909 Taskbar.zip (1.06 MB, 935 views) Click for barcode! Brock1909 bottom task bar.cab (56.2 KB, 280 views) Click for barcode! Last edited by Brock1909; 09-02-2009 at 09:28 PM. This post has been thanked 22 times. Here is my latest task bar. What you are getting is a sneak peak of my soon to be released GadgetROM. This VGA, CDMA only for now. I'll get around to a GSM version as soon as I have the time. Let me know what you think! Thanks to Riley05 and Rusty Duck for some preliminary testing. And thanks to Bilbobrian at XDA for the battery layout, and Tsowen for the icon base. Note, If you are using the Topaz Notification Enhancements, you can install that cab to get a skinned Notifications manager. Here is a preview of what I'll be posting in the next couple weeks. Right now, this is exclusively available in Drybonz' Bear-Bonz ROM for the Sprint Diamond. I am working on the GSM icons now and hope to have something done by the end of the weekend. The current battery is by Misfortune for his TB v2 and is included and modded with his permission. I am actually looking at changing the battery, too, so, ahem, bear with me on that... . If you are a ROM chef and wish to use any of my taskbars in your ROM, just please PM me and let me know. Thanks to Indagroove, the Bear-Bonz Custom taskbar will now work with GrooveROM and Mighty Mike's ROMs. This version includes the revA icon and a few other tweaks. I have also finished and uploaded the GSM version of the Bear-Bonz Taskbar as well! Enjoy! GF Round Taskbar - WM 6.5.cab (1.36 MB, 2712 views) Click for barcode! 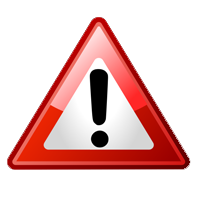 Topaz Notification Manager Mod Round Icons.cab (902.8 KB, 1379 views) Click for barcode! GF Bear-Bonz Taskbar - WM 6.5.cab (1.73 MB, 2147 views) Click for barcode! GF Bear-Bonz Taskbar - WM 6.5 GSM.cab (1.70 MB, 1149 views) Click for barcode! GadgetROM Task Bar.zip (1.28 MB, 2183 views) Click for barcode! Last edited by gadgetfreak; 08-13-2009 at 05:10 PM. This post has been thanked 138 times. If you are a fan of my work, please feel free to . Place Marker for future projects. Accepting Donations - If you like my work, please donate! All Donations go to saving the world, uhhh.. and other things. Specifically to development of ROMs. I will share proceeds with all who have contributed. I am cool like that. Reserved for my taskbar project in the works. It just made my vogue go completely cracked out. finalized soon so I can start working on the technical aspects. Hope to get cracking on this SOON! Last edited by codybear; 06-20-2009 at 05:28 PM. Last edited by conflipper; 04-24-2009 at 01:09 AM.